The Best Story So Far. The Man Charles Frederick Best was born on 26th July 1911 at 20 Cambridge Road, Eastbourne, the only Son of Charles Thomas Best, a Grocer’s Assistant and Ellen Pannell, although he did have two half sisters and a half brother, May, Grace and Douglas, as his father was a widower and had children from his previous marriage. Charles was a member of the local Sea Cadets and Scouts and educated at Willowfield Central School in Eastbourne leaving in 1927 aged 16. He was described as quiet, thoughtful, self reliant, persevering, manly, clear and decided by his Headmaster Frank Ash. He was subsequently employed in1928 as a Draftsman at the Eastbourne Gas Company, which later became the South Eastern Gas Board on Terminus Road. He joined the company’s superannuation fund on 28th October 1929 paying 2d a week and earning £13.00 per annum. Charles also joined the 208th Company Royal Engineers Territorial Army, Service Number 2024413, at the Ordnance Yard, Eastbourne in 1928 serving with them for seven years. During this time he became a good small bore shot, being a member of the winning team in the Small Bore Branch of Sussex County Rifle Association competitions. They won the County League Division IV in 1931, were Country League runners up Division II in 1933 and winners again in 1934. During 1935 he transferred to the 229th (Eastbourne) Field Battery Royal Artillery at The Goffs TA Centre and was promoted to Warrant Officer 1. Military Medal. 1939-45 Star. Africa Star '8th Army'. Italy Star. France & Germany Star. Defence Medal. War Medal 1939-45. Efficiency Medal 'Territorial' & bar. With World War 2 looming he spent many long summer evenings training with the gunners hard at drill on the grounds of Terryside Farm and the specialists and signallers in the local Geldridge Park, living at this time with his parents at 57 Willowfield Road. In the summer of 1939 Charles was selected with other personnel as part of what were known as Key Parties. It was their duty to be called up prior to general mobilisation in order to make ready everything that was required for a Regiment preparing for war. During August 1939 Charles was mobilised to do just this, spending many uncomfortable nights sleeping on floors and eating food prepared by local caterers in a variety of requisitioned schools and other suitable accommodation, which following the outbreak of war on 3rd September were used by the Regiment to accommodate soldiers and their weapons. At the end of September a small party under the command of Captain S M Smith and Sergeant (as he had been granted a war substantive rank) Charles Best were sent to Bridport in Dorset to reconnaissance the area in preparation for the arrival of the Regiment and its stay there for the winter. During this period the British Expeditionary Force (BEF) had moved to France and were occupying a section of the line. These divisions were to be reinforced by the TA during the spring of 1940. As a preliminary measure a reconnaissance party from the TA including Charles, who had been re-promoted to WOII, left Yeovil in January 1940 sailing from Southampton during the night and landing at Le Havre the following morning during a snow storm. They travelled in an unheated Mk 1 train with ice both on the outside and inside of the carriage from Le Havre to the Belgian frontier. Charles was attached to 16th Field Regiment at Rualt where a survey of the battle positions was made. He then endured a journey of 28 hours to the south of France, in an area near to Le Mans, where the division were to concentrate on their arrival, in order to ready billets, vehicle parks and other planned necessities in order to assist the French against invasion.He returned to the UK via Cherbourg to Southampton during February before being sent to France again in March 1940. He had by now been embodied with the battery as part of the 58th (Sussex) FieldRegiment Royal Artillery and later still the 251 / 84 (Sussex) Medium Regiment Royal Artillery. He returned to England in May 1940 having being evacuated from Dunkirk, although little detail is known of this except for a few notes he later penned “French apathy, famous names of villages, Life on the farm, weather, storm breaks, move into Belgium, Belgian Army, Chaos in French and Belgian Army,distress of citizens, return & air attack, the retreat, Dunkirk& the sands, trip home”. Charles spent the next two years in the UK employed on duties in the defence of the Kent area against the threatened invasion by Germany. During this time on 19th May 1941 his father Charles Thomas passed away and was buried in grave Ua 45 at Ocklynge Cemetery, Eastbourne. In May 1942 Charles Regiment which was part of the Divisional Artillery of the 44th (Home Counties) Division, was again mobilised for overseas service to act as reinforcements for the 8th Army in Egypt. They were transported across England by rail to Liverpool, from there they were driven in lorries across the bombed city to the docks and boarded the SS Laconia a cruise liner that had been converted to a troopship, which was to be his home for the next two months together with 4500 other men. On 28th may they set sail and during the voyage took part in various training exercises each day. In June with the weather improving the further south they travelled, they changed from Battledress into Khaki Drill uniform. On 13th June they landed at Freetown, Sierra Leone for five days. They sailed again and arrived at Cape Town, South Africa on 1st July where they spent another few days before sailing again on 5th July. During this leg of the voyage they became acquainted with the ’Cape Rollers’ the giant waves created by an unusually swift opposing current. As they got closer to their destination the temperature on deck could sometimes exceed 123o. Eventually they reached the Red Sea and on 26th July 1942, Charles 31st birthday, arrived at their destination Port Teurfite, Egypt, having been at sea for eight weeks. His unit joined the Eighth Army and fought their way through to Tripoli. It was whilst waiting for the advance into Tripoli that he wrote the first of two papers A Reservist Would Like To Know. On 6th March 1943 he was involved in the battle with Rommel on the Mareth Line near the town of Medenine and subsequently saw action as part of C Troop 230 Field Battery in North Africa at El-Alamein and Enfidaville where on 11th May 1943 he won his Military Medal together with four other members of his troop, an officer who received the MC and two others who were mentioned in despatches. 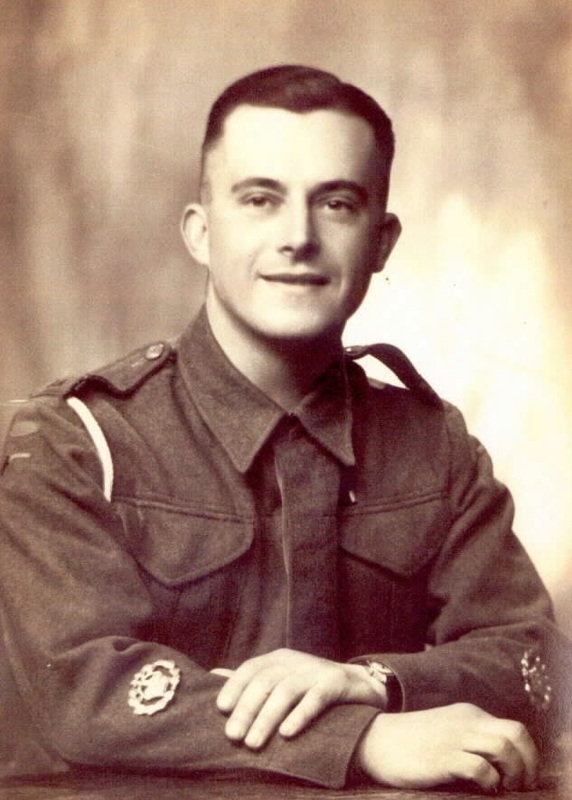 His citation read: Near ENFIDAVILLE on 11th May 1943, “C” Troop, 230 Field Battery was heavily shelled whilst they were engaged on firing a timed programme. The detachment of one gun had already lost its No 1 and another gunner killed. This WO quietly moved from gun to gun commanding and encouraging the detachments, they were very tired after many days of almost continuous firing and had previously been subjected to hostile artillery fire. His manner and bearing, and complete disregard of the safety of his own life under these very trying circumstances, were magnificent. It was a wonderful inspiration to tired men and undoubtedly pulled them together at a critical period. It was signed by the General Officer Commanding 8th Army, B L Montgomery! The notification appeared in the London Gazette of 19th August 1943. Charles was also present on parade lining the route when Churchill and Montgomery visited Tripoli following its capture. Charles returned to the UK for a spell and then embarked upon the Normandy landings on D + 2, 8th June 1944 as part of the 251st/84th (Sussex) Medium Regiment Royal Artillery which actually fired the first shot into the Germany! He fought his way through France and into Holland, his Regiment being placed under the command of the Guards Armoured Division for the crossing of the Seine and subsequent support on the advance through Brussels to the Meuse L’Ecsaut Canal in an attempt to reach Arnhem as part of Operation Market Garden. He continued up through the Valkenswaard and through Eindhoven on the road over the Grave Bridge and into Nijmegan during a dark autumn night. They occupied their position in Nijmegan Park with their guns having an all around field of fire. They became embroiled here for a fortnight living on German rations and Ersatz coffee that the retreating Germans had left behind. He described the surreal scene in which the Dutch people overjoyed at being liberated promenaded in the park in their best clothes and elderly ladies pulling the lanyards of the British guns and firing shells at the hated Boche! Sadly there was an unexpected air raid as a result of their shelling which caught a Roman Catholic party leaving the local Church one Sunday and as a result Charles spent a distressing morning giving vital first aid to badly injured men he had known from pre-war days, through France and Belgium in 1940 and all the hazards of the Middle East. He returned to the UK on leave on Monday 1st January 1945 before returning to Germany and to Victory. 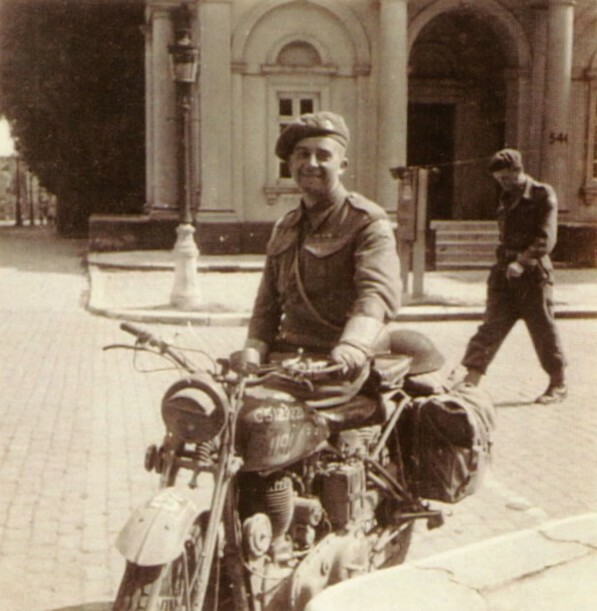 During August 1945 he was posted to Blankenburg, a Spa in the Hartz Mountains where his troop were responsible for the Military Government of the town and surrounding countryside. It was impossible to fulfil all of their commitments and they were assisted by a Squadron of armoured cars from the Household Cavalry. For his war time service he was awarded the 1939-1945 Star, Africa Star with 8th Army Clasp, France and Germany Star, the Defence and 1939-1945 British War Medal. He also received a clasp to his Efficiency Medal for which he had qualified in about 1939. In October 1945 he was demobbed, still living at 57 Willowfield Road and returning to his civilian job as Gas Mains Superintendent which to his frustration was now a reserved occupation and prevented him re-joining the post war TA . He was involved in local Regimental Associations, as secretary of the 58/84th Regiments’ Reunion Club and was the main organiser of the first reunion dinner in 1946 for over 400 old comrades. he was also a member of the Royal British Legion, Royal Artillery Association and theWar Memorial Committee who were responsible for providing a Regimental War Memorial in St. Mary’s Church in Eastbourne in July 1949. On July 15th 1946 his mother Ellen passed away and was buried with her husband at Ocklynge. On 27th March 1948 Charles married a long time friend, Helena Mary Preston, who had been in the Women’s Auxiliary Air Force during World War Two. They were married in St. Mary the Virgin Church, Willingdon and subsequently moved into 30 Cooper’s Hill, Willingdon which they purchased in March 1949. They had one Son Winston Charles Best who was born on 6th October 1949. Charles wrote the second of his papers titled Civil Defence and the Nationalised Gas Industry in 1948. This he circulated together with his first to the many the ‘Great and the Good’ of the day including politicians, ex Senior Officers and was constantly attempting to re-join the TA but was prevented from doing so because of his civilian occupation. and leaving his wife and a three year old son. He was buried following a Church Service with semi military honours, his coffin being drawn on a gun-carriage, draped with a Union Flag and surmounted by wreaths, at St. Mary the Virgin Parish Church, Willingdon on Friday 28th November at 2.30pm. The church was full, the service conducted by Reverend H C F Copsey. The Story This is probably the most poignant story contained in this book and certainly holds a very special place in the author’s affections. 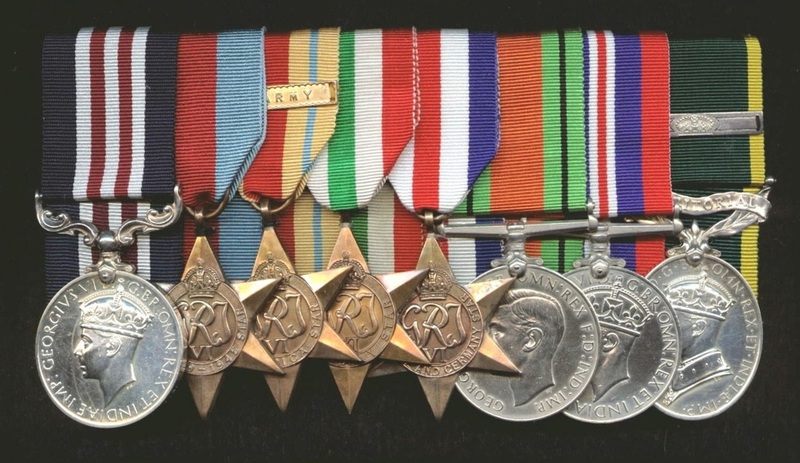 The group of medals awarded to Battery Sergeant Major Charles Frederick Best MM, were first seen at the Orders and Medals Research Society (OMRS) Annual Convention in London in September 1998 and consisted of: a Military Medal George VI, 1939-1945 Star, Africa Star with 8th Army clasp, France & Germany Star, Defence Medal, 1939-1945 British War Medal and Efficiency Medal ‘Territorial’ with additional clasp and a massive archive of paperwork, a silver engraved tray, some tankards and named medallions. Although they raised interest largely because of the Efficiency Medal, such was the cost that their purchase could not be justified at the time. They were seen again at the OMRS Convention a year later in September 1999 and in 2001 the event not having been attended in 2000. By this time, three years on they had been reduced in price slightly and were now well to the ‘back of the stall’. There was still interest in the lot but the cost remained prohibitive. Seven months later during a Birmingham Medal Society meeting on 4th April 2002, the author was asked to assist with judging for the annual President’s Cup in order to assess the best member’s exhibit of the year. There was a display present that included together with medals a lot of photographs and personal papers relating to the recipient, this was marked highly by the author and the medals belonging to Charles Best were again called to mind. As a result of this, the next day, the telephone number of the dealer selling his awards was obtained from an old OMRS convention programme and he confirmed that he still had the medals for sale, five years after having bought them! It was agreed to meet on Saturday 20th April 2002 at Corley Service Station on the M6 motorway and the meeting took place on a damp cool day where the lot was viewed and acquired, thus began one of the most fruitful and emotional research projects to date. From amongst the massive archive of personal papers, diaries and documents contained within the lot it was established that Best had been married to a Mrs H M Best, and that she had been a member of the RAF Association. There was an RAFA membership card and a small passport sized photograph of a lady in RAF uniform, together with an Air Ministry transmission slip detailing the award of the 1939-45 Star, France and Germany Star, Defence Medal and War Medal 1939-45. It was also possible from obituaries in newspaper cuttings to establish a date of death of Charles Best to within one week during 1952. Armed with this information a visit to the Family Records Division, Holborn, London was arranged in July 2002 where Charles Best’s last will and testament was recovered. 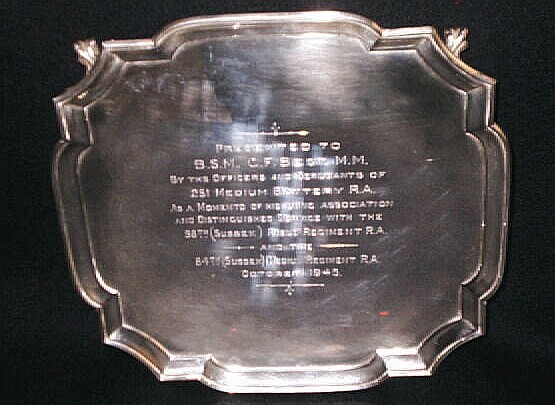 His Will identified his wife as Helena Mary Best, which tied in with the RAFA membership card and confirmed the address at which they had been living in Willingdon near Eastbourne at the time of his death. It also mentioned a Son, Winston Charles Best to whom he wished his medals and papers to be left. From the date on the RAFA Membership card, late 1980s, a further speculative search uncovered Helena Best’s Will and it was revealed she had died in 1997, one year before the medals were first seen at the OMRS Convention! Her Will contained a lot useful information including the names and addresses of her executors, Brian Court- Mappin and Roger Preston. A call to directory enquiries revealed that both executors still lived at the same addresses and after much consideration Mr Court-Mappin was 'cold' called one morning in July 2002. He was very positive and felt sure that Mr Preston, who was Helena Best nee Preston’s nephew, her brother Ronnie being Mr Preston’s father, would also welcome a call. He too was ‘cold’ called later the same day and his response very favourable, he was very keen to assist with any research and to help if he could. A visit to Willingdon was arranged later in the month on 25th-26th July 2002, where a very fruitful two days were spent with Roger Preston and his wife Sheila who provided further useful information and had kept an amazing amount of photographs and additional paperwork about both Charles and Helena, or Aunty Bloss as she was known. It was established that they had a son, Winston who had died young in 1976 and that Bloss had lived on her own until her death in 1997. The medals awarded to Charles had been left by him in his will to Bloss on the understanding they passed to Winston and retained in the family in perpetuity. As Winston had died they were kept by Bloss until her death in January 1997 and there being no family to pass them on to Roger Preston had decided to sell them with Charles’s personal ephemera at auction, the proceeds being donated to the Royal British Legion in Willingdon in their memory. They were purchased direct by the dealer in February 1997 who included them for sale on his list. During the visit Roger Preston took time to visit St.Mary’s Church where Charles was buried, sadly no headstone had ever been erected, the Downs, part of the National Park overlooking Willingdon where Bloss and Winston’s ashes had been scattered and to see a former friend of Bloss’s, Mike Goss, who had known her well, his daughter once interviewing her for a university project about her war time experiences. The Preston’s were also taken out for dinner as a thank you. Roger Preston had kept Bloss’s medals awarded for her RAF service during World War 2, these being the 1939-1945 Star, France & Germany Star, Defence Medal and War Medal 1939-45. 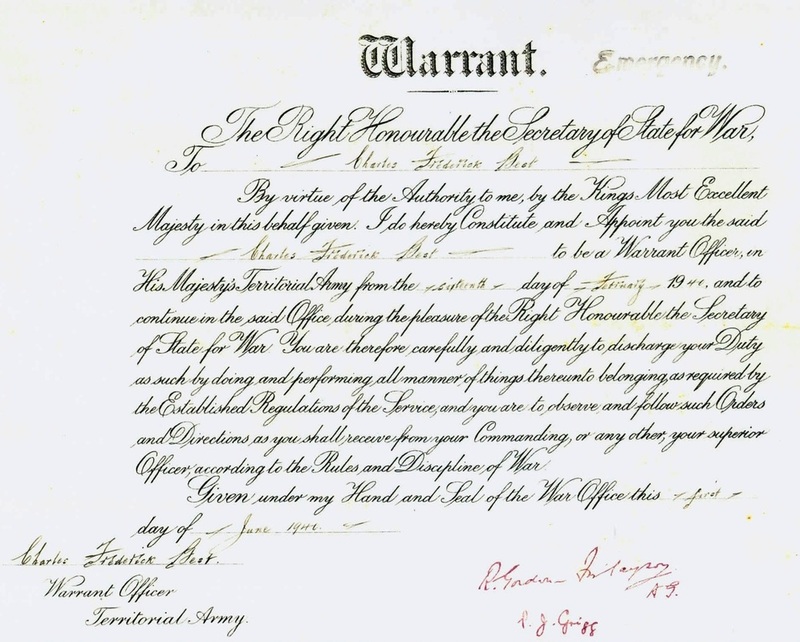 It was now clear that the medal tansmission slip contained in the original paperwork was indeed hers and that it was an unusual campaign group for a female recipient. Coincidentally after the visit a letter was received from Brian Court-Mappin enclosing both a portrait photograph of Bloss in uniform wearing the medal ribbons and one of her original brass RAF tunic buttons. During the next 12 months and armed with the additional information much further work was completed on the Best Story and the information gathered was all collated - no mean feat. One area that was explored was the possibility of having a headstone erected for Charles. The Vicar of St. Mary’s, Father Martin Onions, was not happy for this to happen but was receptive to a grave marker and for a donation to be made in memory of Charles and Bloss in the form of an Altar Stool for the church. Negotiations then began with the Willingdon Branch RBL, who admitted they had not yet spent the money donated to them following the sale of the medals five years before. They agreed to give back a proportionate sum to pay for the Altar Stool and on 8th-9th August 2003 a further trip to Willingdon was made, this time Brian Court-Mappin was also present. Yet more extensive visits were made to Best’s old houses, schools, the TA Centre, Geldridge Park, Winston’s birth place and a meeting held with the local RBL representatives, Fred Gorsuch and Lt Col O’Keefe, to formalise the return of some of the donation. The Preston’s were by now becoming friends and a very pleasant meal was taken in their home, Roger also loaned the entire ‘Best’ archive he had originally kept back to enable it all to be copied. He also kept in regular e-mail contact. Roger had previously explained that he had to go to hospital for a heart operation later in the year and his last e-mail in relation to this research was received on 9th November 2008 and ended ‘Now I’m off for a few weeks! Keep Well’. Sadly a few days later on 30th November Roger died following the surgery. This was a huge shock as Roger had been a real driving force behind the Best Story and was glad that his relatives were being remembered and had been keen to see the final result. 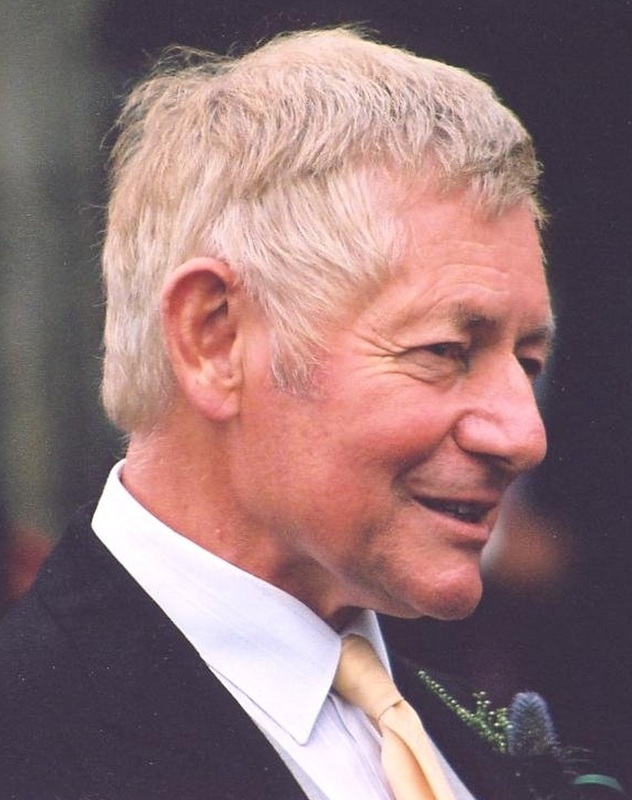 Contact was maintained with his wife Sheila for a short time afterwards and indeed with Brian Court- Mappin and it was hoped that the Altar Stool and grave marker project would be pursued, but sadly with Roger’s demise this did not happen. Shortly after his death Sheila very kindly sent Bloss’s medals with instructions that they be kept with Charles’ and the paperwork on a ‘permanent loan’! A meal was also taken with Brian in London some months later. An interesting post-script was that Roger had authorised Best's army records be requested from the Army Records Office. When they arrived it was revealed that Charles had later been awarded the Italy Star in May 1953 just after his death. This explained the presence in the original lot of paperwork of a medal issue certificate with just one award - The Italy Star! One was subsequently added to the group which now appears as Charles himself would never have seen it. Yet again, this story demonstrates that all is not what it first appears when a set of medals are seen in poor condition on a dealer’s table. A lack of interested buyers does not mean there is no interesting story and once you have the courage to open Pandora’s Box you never know what is inside. This is indeed The Best Story So Far! and what is so sad is that all that is left of this family’s life is contained within this research! During April 2016, 16 years after the medals initial acquisition, contact was made via this web site by Gordon Bourne,who had some years previously acquired a scrapbook completed by Charles Best whilst at Willowfield School in 1924 and aged 13 following his visit to the Empire Exhibition at Wembley. Yet more archive material for The Best Story and another example of positive outcomes as a result of this web site. SS Laconia Was Was built at the Swan Hunter shipyard on the Tyne in 1921. At 19,680 gross tons, she had accommodation for 2,200 passengers in 3 classes. Sailing from Southampton/Liverpool to New York via Hamburg and Queenstown (modern day Cobh) she carried many thousands of emigrants to America. At the outbreak of World War II, she was converted to an Armed Merchant Cruiser at the naval dockyard in Portsmouth, and armed with eight 6-inch guns and two 3-inch anti-aircraft guns, In 1941 she was converted again, now to be a troopship. It was in this role, with 1,800 Italian prisoners-of-war, and more than 700 British troops and their families on board, she was torpedoed and sunk by a German submarine, north of Ascension Island in the South Atlantic. When the first torpedo struck, over 400 Italian prisoners were killed in the explosion and many more were still on board when Laconia sank. When the submarine surfaced and approached to pick up survivors it was realized who was on board and help from other submarines, and ships from Vichy controlled France were called to take on the survivors. Too see a selection of photographs from Charles Best's life click here. Charles Best wrote a number of informed papers and it had been his intention to write a book. Click on each of the links below to see them in detail. 'Trooping' is highly recommended! The Best Story So Far is dedicated to the memory of Roger Baden Preston, without whose help, support and friendship this story would not have been possible and the Best's not commemorated for posterity. To see Charles Best's photograph album click here. Military Medal: 2024413 W.O. CL.II. C.F.BEST. R.A.
1939-45 Star: Unnamed as awarded. Africa Star: Unnamed as awarded. Italy Star: Unnamed as awarded. France & Germany Star: Unnamed as awarded. Defence Medal: Unnamed as awarded. War Medal 1939-45: Unnamed as awarded. Efficiency Medal: 2024413 W.O.CL.II. C.F.BEST. R.A.